Amazing Painted Fusible Web Update: My class at Zephyr is full, but there are still spots in Jane, Heidi & Sandra’s classes! Hi! I’m Mary Boalt, one of the four instructors of Artistic Alchemy. Let me introduce you to one of the most unusual and versatile embellishment techniques I know and love. After having taught this method for over ten years, I have come to really appreciate the extraordinary results that come from this unique application of paint to fusible web. This easy process can be applied to clothing, wall hangings, quilts, pillows, tote bags, journal covers and whatever else you can dream up! The finished product has such a mysterious finish that people will wonder what it is and how you did it. I will share with you all the tips and tricks I have discovered over the years using this magical technique. With three full days (and evenings, if you’d like) you will be able to delve deep into this technique and complete one or more beautiful projects of your choosing, depending on your sewing skill level and the difficulty of the project you bring. On Friday morning I will provide and guide you through a quick and different project for everyone. It will be a surprise application of the painted fusible web that you can take home completed and ready to use! If you are interested in a clothing project, I suggest a simple vest pattern with no darts and the least amount of seams. Heidi’s Terrific Tabard pattern is perfect. It’s only three pieces. A long sleeveless duster would be gorgeous. MAKE SURE THAT YOUR PATTERN FITS YOU BEFORE YOU ARRIVE! This techniques works most beautifully on black. I have been experimenting with white. You might consider buying both so that you can experiment in class. Although it doesn’t have to be any special fabric, for a garment I suggest the Luxe Cotton from JoAnn. Use your coupons! I found it in the quilting section. It’s a nice weight, drape and tight weave for this technique. Buy enough fabric to complete your garment or project. For a more sturdy project like a journal cover or tote bag, I suggest something heavier like cotton duck. This technique cannot be done without silk organza. You can order black and/or white silk organza from Dharma Trading Company. They have the best prices!!! Buy enough to completely cover your project. In other words, the same amount needed to make the project. Buy black organza if you’re making something with black fabric, white silk organza if you’re making something white. Do not substitute with poly or nylon organza or tulle. I like to line my vests with matte satin from the Casa Collection in the formal/dressy section of JoAnn. Bring whatever you would like to line your garments but buy enough to fully line it. The same recommendations as above. Bring enough fabric, silk organza and lining to complete your project. Journal covers and pillows don’t need lining. Remember, bring heavier fabric for tote bags and journal covers. There are five sheets in each package. I cannot know how much coverage you will want on your project. I would buy one or two packages for a small project and perhaps three or four for something larger. You will not be entirely covering your project, just embellishing it. And remember, what isn’t used in class can be used for other things in your sewing future so it will have a place and purpose in your notions drawer. 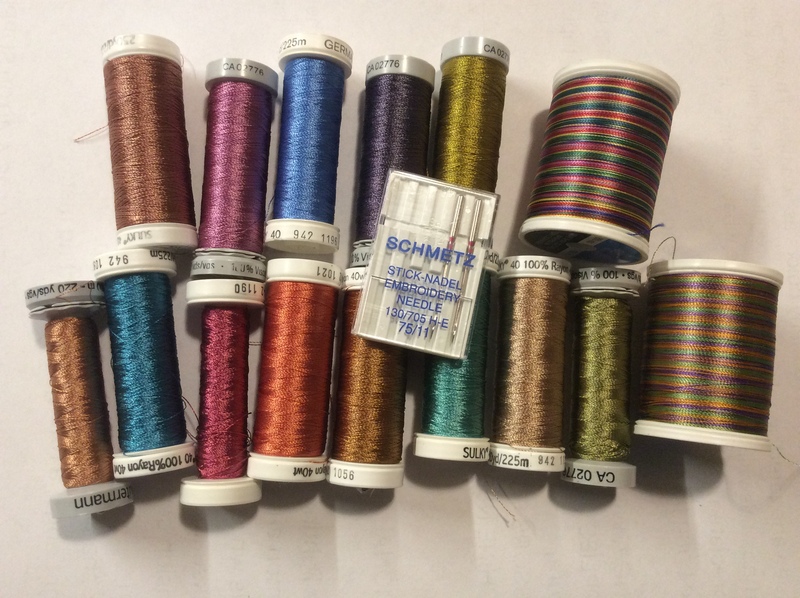 I like to use rayon embroidery thread. The shine makes your project look special. Bring as many colors as you have in your supply. I have found some variegated spools I love. Any regular thread will work also. Perhaps this will be an opportunity to share what we bring. It’s always appreciated. Also bring plain black and white thread. Snacks…our beautiful room has a refrigerator. Black sharpies. Extra fine and fine tip. Straight edge, rotary cutter and cutting mat. As usual, I will provide all the plastic drop cloths. The facility requires that I drape the room while using paints. I will bring all the stamps. I will bring tablecloths & parchment paper. I will provide sponges, brushes, plates, water tubs for each table. I will bring all the beads, beading needles and beading thread and give you a quick course on how to “embellish your embellishments”! You can take these home with you. I will also provide you with everything you need for your Friday morning surprise project. And my sister Patty will be there to help you keep your space and tools clean and save you time away from the dreaded kitchen sink. And lastly, please bring just one or two items you have made for show and tell. It can be anything. A garment, quilt, knitting, crocheting or even some jewelry. It is much appreciated and adds to everyone’s enjoyment and exposure to other art mediums. As I mentioned, this is one of the most unusual embellishing technique I have ever seen. The results are amazing, gorgeous and easy to achieve. You will most assuredly have a one of a kind project you will be proud of and others will admire for years to come.